Throughout the Power Generation and Chemical/Refining industries, many vessels operate at high temperature and pressure. This makes them susceptible to risk of failure as the refractory lining degrades or the process changes. The consequences of undetected refractory breakdown can be catastrophic - fire, explosions, loss of life - causing major monetary losses due to spoiled product and production downtime. The illustration portrays a typical design for Viper’s Hot Spot Detection System (in this example, a Gasifier) using FLIR A-series cameras. 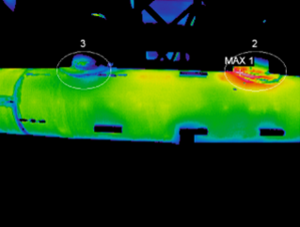 Viper’s design places 2 - 32 cameras around the vessel ensuring the most complete heat map possible. The camera’s digital data stream is connected via Ethernet to the ViperVision control system. The ViperVision software controls all camera functions, collects temperature data, displays thermal images and analyzes data. Hydrogen Reformer Collection Header - In this process, fuel is converted to hydrogen using heat. Viper's system is beneficial for monitoring the collection header by seeking refractory degradation. See the corresponding image for how this degradation is evident by the "hot spot." Prevent unsafe conditions and product loss! Gasifiers - Viper's approach to Hot Spot Detection for critical vessels eliminates or minimizes the installation of point contact temperature sensors such as thermistors, thermocouples, RTDs, or solid-state devices. Avoid the guessing game of whether contact sensors are placed in the correct location relative to process flows and reaction locations. Viper's design eliminates this concern by monitoring the entire vessel and its surface, providing instantaneous non-contact temperature measurements. FLIR cameras' digital data stream is connected to the ViperVision control system. The ViperVision software controls all camera functions, collects temperature data, displays thermal images and analyzes data. Engineers now have the data they need to make critical decisions about vessel repair and renewal. Rotary Kilns - Viper's systems utilize a wavelength optimized infrared optical system to see through the smoke, ash and haze produced within high temperature kilns. The system is typically installed on the hot end of the kiln with fiber optics or the plant network which transmits video and data from the kiln to the control room. The operator will have real-time video of the process interior displayed on high resolution monitors.